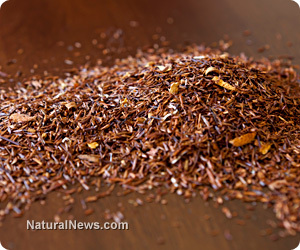 (NaturalNews) A member of the legume family, rooibos "red bush" is a shrub with needle-shaped leaves that grows in South Africa's fynbos, one of the richest botanical areas in the world. It is used to make a flavorful caffeine-free herbal tea with many healthy nutrients, and has been very popular in South Africa for generations. Sometimes called bush tea, redbush tea, or South African red tea, rooibos tea is grown in a small area of the Western Cape. The leaves are oxidized, not fermented, as is often said by way of analogy. The oxidation process produces the distinctive reddish brown color the tea is named for, and enhances the flavor. Unoxidized "green" rooibos is also available, but its more involved production process means it is more expensive. Even with twice the flavonoids, it is not as popular as the red. The taste is different too, with a malty and slightly grassy flavor whereas the red has a sweet, nutty flavor. In the early 1900s, a Russian tea merchant, Benjamin Ginsberg, visited the area. His knowledge of Chinese and Indian teas was instrumental in helping establish the first successfully cultivated field of rooibos, and in marketing it as "mountain tea" - an herbal alternative to tea (http://www.rooibostea.com/history-of-rooibos-tea.php). He immigrated, and his son continued his work farming and cultivating high quality rooibos tea. His grandson introduced it to the UK and other international markets, where it was well received. Much of the Ginsberg family's processes are still in use today. The popularity of rooibos tea continues to grow worldwide, especially among the health conscious. It has many of the same health benefits of green and white teas without the caffeine and high tannin content. It is high in antioxidants, which fight free radicals and the oxidation they incur on our organs and tissues, helping to keep the body healthy and strong. Rooibos is also credited with easing tension, boosting the immune system, and hydrating the body. It is increasingly available in the United States where it can often be found in coffee shops. Coffee shops around the world have begun offering rooibos-based variations on coffee drinks, such as "red espressos," "red lattes," and "red cappuccinos." Studies on rooibos' phytonutrients and their applications are ongoing and still being discovered. From quenching the thirst of athletes to calming hyper children, rooibos tea is a wonderful beverage with many uses and health benefits, and varying tastes that will delight tea enthusiasts.